Gerald Kotlowski, age 87, of Plymouth, passed away peacefully at Sharon S. Richardson Hospice in Sheboygan Falls surrounded by loving family on April 2, 2019. He was born on February 27, 1932 in Milwaukee, a son of the late Alois and Bernadine (Brooks) Kotlowski. He grew up in Milwaukee with six brothers and two sisters. Jerry was a wonderful basketball player and made the All-City Honorable Mention for Bayview High School. He graduated from Bayview High School in 1951. In November 1951, he enlisted in the United States Air Force in Idaho and was stationed over in Sasebo Japan. He fought in the Korean War as an air gunner flying a B29 and flew 27 Missions. When he returned from the war, he was in the 128th Tactical Control Squadron Wisconsin Air National Guard and the Reserves. He later retired from the Air Force on April 5th, 1979. Jerry was an incredibly intelligent man with experience in a number of areas. He married Rose M. Shea (Wagner) on June 21, 1980 at St. John the Baptist Catholic Church in Plymouth. 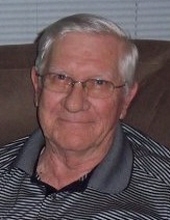 Jerry enjoyed golf, fishing, and spending time being a Bapa to his grandchildren. He started going up as a teenager to Big Sand Lake in Phelps, WI, which became a place to make family memories for years to come. Survivors include his wife, Rose; Three children: JoAnne (David) Kemnitz of Minocqua, Brian (Kaylie) Kotlowski of Howards Grove, Denise (Randy) Paul of Sheboygan; Son-in-law: Randy Brooke of Sheboygan; Grandchildren: Savanah, Britta, Noah, and Carson; Brothers: Carl (Jeannie), Tom, and Bob (Jean) Kotlowski; Sister: Sue (Paul) Ferr; Sister-in-law: Elizabeth Arenz; and Special friend: Debbie (Mike) Eder. He is also survived by many nieces, nephews, other relatives and special friends. He is preceded in death by his parents; Daughter: Deb Brooke; Brothers: Joseph (Irene), Kenneth and Dan (Betty Brooks) Kotlowski; Sister: JoAnne (Hank) Belmarce; Sisters-in-law: Janice and Bea Kotlowski; Brother-in-law: Ervin Arenz; and Nephew: Joseph Jr.
Memorial services will be held on Friday (April 5, 2019) at 6:00 PM at the Suchon Funeral Home in Plymouth. Father Wayne Bittner will officiate. Visitation will take place on Friday (April 5) at the Funeral Home from 4:00 PM until time of service. The Plymouth VFW World Cheese Center Post #5612 will conduct Military Rites following the service at the Funeral Home. In lieu of flowers, a memorial fund is being established in Jerry’s name. The Suchon Funeral Home and Cremation Services is assisting the family. For online condolences, please visit www.suchonfh.com. The family would like to thank the staff of Sharon S. Richardson Community Hospice for the wonderful care and compassion given to Jerry. To send flowers or a remembrance gift to the family of Gerald Kotlowski, please visit our Tribute Store. "Email Address" would like to share the life celebration of Gerald Kotlowski. Click on the "link" to go to share a favorite memory or leave a condolence message for the family.